Laminate is a manufactured product that simulates the look of hardwood, tile or stone. It is extremely durable and wear resistant. 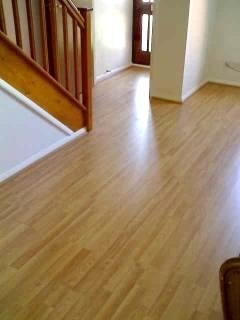 Laminate can be installed over almost any type of floor or subfloor. It is less expensive than real wood or tile, and with new technology, many laminate floors have a very realistic look. An installation of laminate flooring is generally quicker and creates much less dust and chaos than a standard wood floor install. The other benefit is that as soon as it is in, it is done - no staining and coating required.